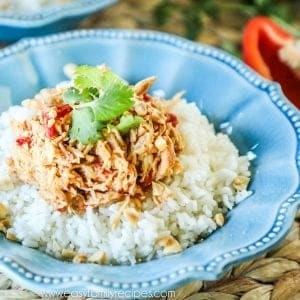 When you want take out but need to make dinner at home, this Slow Cooker Thai Chicken hits the spot! This recipe is super easy since it cooks away in the the crock pot while you work and is so full of flavor that you won’t believe how simple it is! I’ll be honest… for a very long time I just wasn’t into Asian food. I would far rather have almost anything else, but the problem was I wasn’t having the good stuff. And this recipe my friends, is the good stuff! When my friend Liz gave me this recipe years ago telling me it was one of her favorites, I wasn’t sure about it, but I really trusted her when it came to dinner ideas and decided to give it a try. 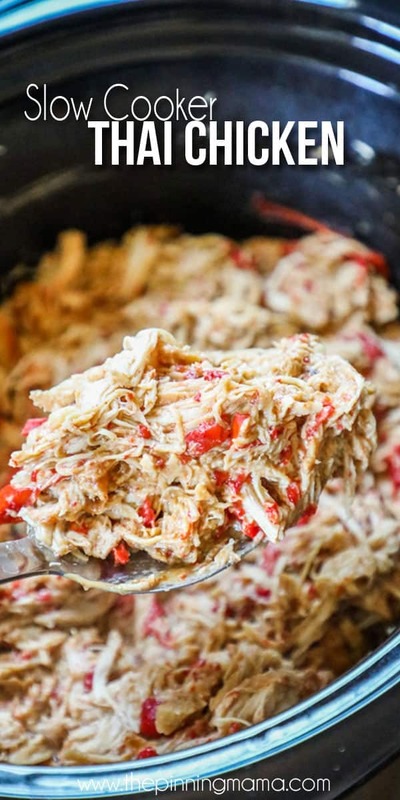 Her original recipe was for pork, but since we don’t eat much pork in our home, I converted it to a crock pot chicken recipe, and over the years have tweaked it bit by bit to where it is just perfect in our humble opinion. While, I wouldn’t by any stretch call this authentic Thai cuisine, this Slow Cooker Thai Chicken is absolutely an easy dinner that everyone in my family will not only eat but really enjoy. My kids love peanuts and so the familiar flavor in this dish is a big winner! If you want a similar dish without peanuts, you can check out this crock pot asian chicken recipe. I love to serve this Thai chicken in a bowl on top of a big bed of jasmine rice. The rice soaks up the rich peanut sauce and makes the dish really hearty. If you are low carb, you could use cauliflower rice instead. The other essential for this recipe is some crushed peanuts. It gives the dish a bit more texture and more of that rich nutty flavor. We absolutely love cilantro in our house so I always throw a nice hearty handful on top as well for a nice fresh zing. Of course you can leave it just like that and it will be delicious, but one of my favorite parts of this recipe is that you can customize it for each person with a drizzle or teriyaki sauce and a drizzle of spicy mayo. You can add more teriyaki to make it sweeter, or more spicy mayo to make it have a bit more heat. I do just teriyaki on the kids and a little sweet and a lot of spicy on mine! With the sweet, the spicy, the fresh cilantro and the rich peanut flavor, there is just so much deliciousness going on in your bowl. Over the years I have made this I have accumulated a few tips and tricks along the way. Below I will go through the recipe step by step, adding in all of my notes and tips and tricks along the way. If you have a question on how you make this dish, it is most likely answered below. If not, feel free to leave me a note in the comments and I would be happy to answer! For the quick version of the recipe, scroll down to the recipe card below. 2 lbs boneless skinless chicken breast (about 4 chicken breasts)– I usually use one regular package from the store, if it is over or under 2 pounds a little it is okay. 2 red bell peppers, cut into strips– try for large firm peppers. Cut out the seeds and ribs and then slice it up. I usually half the slices length-wise as well so that they can really mix in. 3 cloves garlic, minced– fresh or jarred will work here. 2 tsp red pepper flakes (optional)– I usually leave this out when I am making it for kids, but it really doesn’t add much spice. It just gives it a little flavor boost. 1/4 cup creamy peanut butter– I use classic Jif here. You can use creamy or natural, both will work! chopped peanuts– I just use regular old salted peanuts for this that I do a rough chop with the knife. cilantro– I usually just chop it up so it is easy to eat. If you don’t like cilantro, you are crazy (just kidding! ), but you can try green onions instead. teriyaki glaze– I get this in the asian food section of the grocery store. I think the brand I use is Kikkoman. spicy mayo– This is a sriracha mayo blend and it is delicious! Grab the recipe for spicy mayo here! lime wedges– I put these on the side of the bowl and then squeeze it over the top right before eating. Place the chicken, bell peppers, teriyaki sauce, vinegar, garlic and red pepper flakes in a crock pot on low for 6-8 hours. You could also cook on high for 4 hours if you are short on time, but I usually do right around 6 hours on low. After it has cooked, use a fork to shred the chicken and mix with the juices in the slow cooker. The chicken should be tender enough that you can pretty much just stir it with a fork and it will fall apart. I usually just do it right inside the crockpot so that I don’t even get another plate or cutting board dirty. Add the peanut butter and stir until combined. The heat from the chicken should melt the peanut butter and it should completely combine right into the mixture. Serve over jasmine rice (or whatever rice you prefer) and top with any combination of the toppings that you prefer. Enjoy! This crock pot thai chicken is one of our favorites, especially when we set it up with all the delicious toppings. If you get a chance to make this recipe, I would love it if you left me a note in the comments. Or even better, snap a pic and share it on Instagram tagging me @easyfamilyrecipes. I absolutely love seeing what you are making! 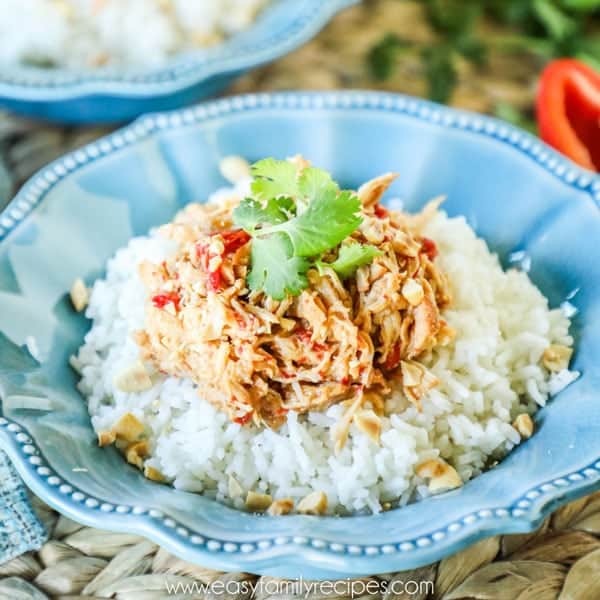 This quick and flavorful slow cooker Thai chicken is every bit as good as take out and every bit as easy! 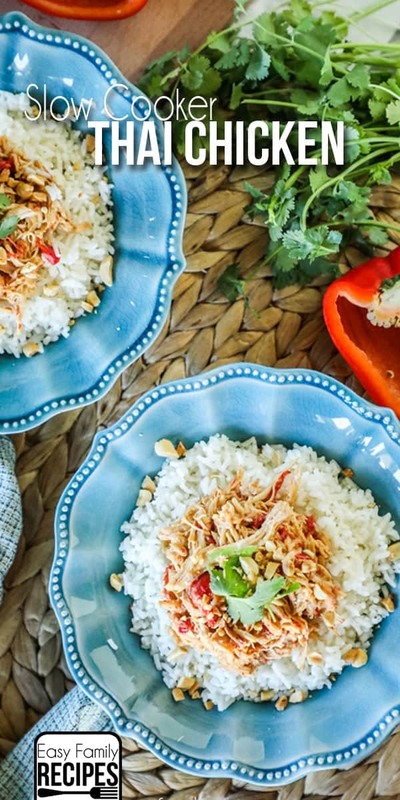 It is full of tender chicken, sweet red peppers, and rich peanut flavors that make the perfect topping for a bed of jasmine rice. Place the chicken, bell peppers, teriyaki sauce, vinegar, garlic and red pepper flakes in a crock pot on low for 6-8 hours. After it has cooked, use a fork to shred the chicken and mix with the juices in the slow cooker. Add the peanut butter and stir until combined. Keep leftovers in an air tight container in the refrigerator for up to 3 days or in the freezer for up to 3 months. This tastes just as good reheated as it does fresh, so it makes a great option for meal prepping lunches. This was DELICIOUS and SOOOOO easy. ALSO, for anyone who has a peanut allergy in their home & avoids Thai places for fear of cross-contamination…YOU CAN DO THIS ONE AT HOME AND ENJOY THAI FOOD WITHOUT ANY HESITATION! It’s so good. Just use cashew butter and cashews!!!!! THANK YOU, KIMBER!!!! Good, but his is more than 17 carbs before any added toppings such as cilantro, lime juice, green onions etc. It incorrectly shows 7 carbs above. It’s important to know the carb count is more than twice as much as stated. Diabetics, and people losing weight via LCHF should be aware and always do their own carb calculations. This is a very high carb meal.